In Schwalm whitework, hems are not only decorated with Four-Sided Hem stitch, Peahole Hem stitch or Needleweaving; they are also adorned with small decorative borders worked along the seam. The arch border is a very special adornment. There are different versions of arch borders. Here I will present a very plain one – arches placed side by side, separated by a single narrow leaf. 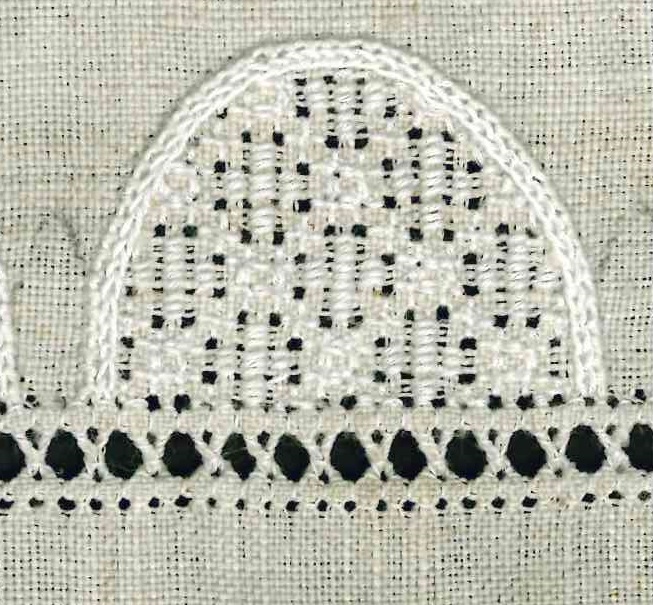 These arches can be decorated with various filling patterns, and so one can achieve something like a sampler where many different patterns are kept always in sight. It is very easy to take a half-oval shape, surround it with Coral Knot stitches and Chain stitches (worked on the inner side of the Coral Knot stitches), and to fill the shape with any filling pattern. However, I decided to connect the arches directly to the Peahole hem. 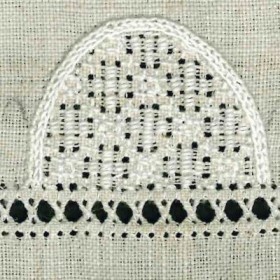 In this instance, the withdrawn vertical threads are not cut along the edge at the top of Peahole hem, but turned down and caught in the Four-Sided stitches at the top of the Peahole hem. More detailed instructions will be the subject of future articles. Danke für die reizvollen Ideen. Freue mich schon sehr, wenn ich ein Stück wieder beginnen kann. Schön, dass Sie meine Ideen reizvoll finden und Freude daran haben. So soll es ja auch sein. 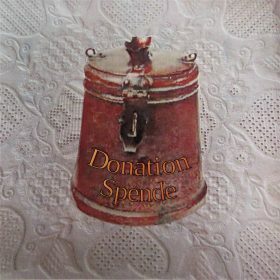 In den nächsten Wochen werden noch ein paar weitere kleine Projekte vorgestellt, die sicherlich auch Ihr Gefallen finden werden.